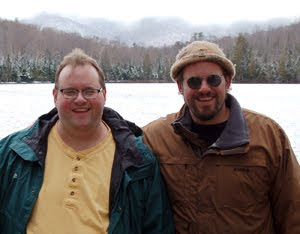 As only twins can do, Tupper Lake natives Andy and Steve Flynn each launched their own small businesses in early summer 2009, a few months before their 40th birthday. Andy makes books. Steve makes wine. Andy's sixth volume in the book series, " New York State 's Mountain Heritage: Adirondack Attic," was released on May 27, 2010. He uses his college degree to write, edit and publish history books and the Meet the Town community guide series and to produce a monthly "Adirondack Attic" radio series for North Country Public Radio. He lives in Saranac Lake , N.Y. with his wife, Dawn. Steve opened his winery, Vino Salida Wine Cellars, on May 28, 2010. He uses his college degrees to create unique photography and paintings and to illustrate the finest winery newsletter in the Arkansas River Valley . Rumor has it he makes damn good wine. He lives in Salida, Colo. with his fiancée, Judy. Andy and Steve Flynn, born 1 minute apart on Tuesday, Sept. 9, 1969 to Michele and James Flynn, in Jersey City, N.J., lived near their extended family in Glen Cove, Long Island for the first six years of their lives, then moved to Tupper Lake, N.Y. in the heart of the Adirondack Mountains in 1976, close to their mother's college alma mater, SUNY Potsdam, and in the same town as her college roommate. The twins graduated from the Tupper Lake High School in 1987, Steve as the valedictorian, Andy ranked No. 5 in his class. Both were outgoing children, keeping busy with school work, extracurricular activities, jobs, and their passions. Andy secretly wrote poems during his newspaper route, and Steve secretly made wine in his closet. Andy graduated from SUNY Fredonia in 1991 with a degree in communication (major in radio production, minor in English). He moved back to New York 's Adirondack Mountains . Steve graduated from Cazenovia College (1989) and SUNY Purchase (1991) with art degrees. He finally found a home in the Rocky Mountains of Colorado. 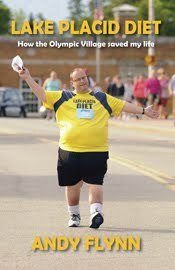 Learn more about Andy’s books by calling (518) 891-5559 or visiting online at www.hungrybearpublishing.com. He works out of the Hungry Bear Publishing home office at 40 McClelland St. , Saranac Lake , NY 12983. Learn more about Steve's wine by calling (719) 539-2674. The winery is located at 7729 County Route 150, Unit C, Salida , CO 81201 . Tours are available from 11 a.m. to 6 p.m. daily from Memorial Day weekend through October. The Flynn twins are holding special events this year to share their passions with neighbors and friends. Andy will host the “Adirondack Attic 6” Book Release Party at 7:30 p.m. Saturday, June 26 at Saranac Village at Will Rogers in Saranac Lake . It is free and open to the public. Steve will host the annual grape-stomping festival, SmelterStomp 2010, from 1 to 6 p.m. Sept. 25-26 at Vino Salida Wine Cellars in Salida. Adirondack Attic 6 has arrived! Well, folks, it's here. "New York State's Mountain Heritage: Adirondack Attic, Volume 6," by Andy Flynn, arrived in Saranac Lake this afternoon. It includes 53 "Adirondack Attic" columns I wrote in 2008. Yes, believe it or not, there were 53 Wednesdays in 2008, even though there were only 52 weeks. Go figure. My columns were always released on a Wednesday. Each chapter features a story about a different artifact in the collection of the Adirondack Museum in Blue Mountain Lake, NY. Learn more about the book: See the Table of Contents. Better late than never. Initially, Attic 6 was supposed to be printed in 2009; however, due to finances, I was not able to print it at the time. So, here it is, better late than never. Actually, it's great timing since my monthly Adirondack Attic Radio Series just started airing on North Country Public Radio. The cost for Adirondack Attic 6 is the same as the previous Adirondack Attic books, $18.00, and you can purchase them online at the Hungry Bear Publishing Bookstore. Also, join me at 7:30 p.m. Saturday, June 26 at Saranac Village at Will Rogers in Saranac Lake for the Adirondack Attic 6 Book Release Party. It is free and open to the public. Help me celebrate this final book in the Adirondack Attic series. Is there ever enough time to write? Oh boy. May has been a whirlwind month, both personally and professionally. So much going on and not enough time to write. Prayers go out to my mother-in-law, Alice, who has been in and out of the hospital since Mother's Day. We've been traveling a lot to see her in the hospital at Plattsburgh (even spending her 70th birthday, May 21, at CVPH). She has good days and bad days, and I hope she can make it home soon. She at least needs to attend my June 26 Book Release Party for "New York State's Mountain Heritage: Adirondack Attic, Volume 6," which should arrive in Saranac Lake by Friday (fingers crossed). The party will be held at 7:30 p.m. Saturday, June 26 at Saranac Village at Will Rogers in Saranac Lake. It is free and open to the public. I hope Alice can make it; after all, I dedicated this book to her. She has to come! The new Meet the Town booklet for Canton is currently at the printer and should arrive by mid-June. The new Potsdam Meet the Town will be going to the printer today or Thursday and should arrive shortly after the Canton booklet gets here. 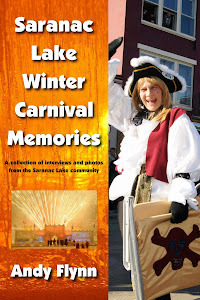 Right now, I'm also putting together the new Saranac Lake and Au Sable Valley Meet the Town community guides. And I'm busy distributing all the books to communities now that the busy season is upon us. I'm planning a few events for June, including a PR101 Workshop on June 9 in Tupper Lake (free for Meet the Town advertisers and Tupper Lake Chamber of Commerce members) and on June 16 in Newcomb (free for Meet the Town advertisers and Newcomb Chamber members). Also, I have two Adirondack Artifact Night programs set: June 18 (7 p.m.) with the Wilmington Historical Society at the Wilmington Grange Hall; and June 29 (7 p.m.) at the Goff-Nelson Memorial Library. I encourage people to bring in artifacts from home for a show-and-tell session. I want to hear all about your objects and local history! The Artifact Night programs are free and open to the public. And I finally have a time slot for the new Adirondack Attic Radio Show on North Country Public Radio: the first Tuesday of the month during the Eight O'Clock Hour with Todd Moe. That means June 1 for the next one. Listen to the two previous programs on the Hungry Bear Publishing web site. Thanks to my sponsors: Dan Berggren and the Adirondack Museum. I've also begun developing a new web site for the Adirondack Attic History Project. Now that I've taken some time to write, it's back to work. I'm looking forward to attending the Adirondack New Media/Social Media event on May 7 at the Adirondack Museum. Adirondack region new media/social media writers and producers are invited to gather at the Adirondack Museum from 5 to 7 p.m. for a networking event and backstage tour of the Adirondack Museum's newest exhibit "Let's Eat: Adirondack Food Traditions." Local bloggers, Twitter users, social media writers and producers, and new media journalists will be getting together in the Adirondack Museum's "Living With Wilderness Gallery" for food, drink, and networking, before taking an early behind the scenes look at the Museum's featured 2010 exhibit. This event is sponsored by the Adirondack Pub and Brewery and the Adirondack Winery and Tasting Room (both in Lake George), the Adirondack Museum, and Adirondack Almanack. For more information, contact John Warren at adkalmanack@gmail.com.